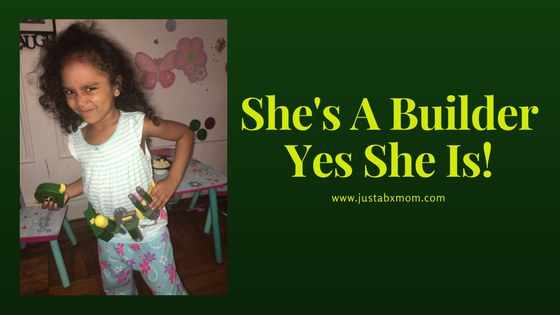 She’s A Builder – Yes, She Is! During the week when her cousins aren’t around JustaBXgirl does A LOT of independent play so I’m constantly on the lookout for toys that can keep her engaged so I can get more than ten minutes of work in at a time. As much as we love board games and puzzles weekdays aren’t the time for them as she needs mama’s help and participation. Pretend toys are a big hit right now as her imagination is incredible. As I type this she has put together about four different playsets and is gathering a bunch of mini figures together to throw someone a surprise birthday party. I’m not even sure where she got the idea of a surprise party but I’m enjoying listening to the festivities. We received this product for review purposes. As always all opinions are honest and solely mine and Juestabxgirl’s. This post contains affiliate links..
Other days she might invade the costume ottoman and dress up like her favorite princess or her favorite Ninja Turtle or become a mermaid. Perhaps throw on some fairy wings or more recently grab her John Deere Talking Toolbelt Set and set about fixing things around the house. She straps it on and tells me with confidence that we don’t need grandpa because she can fix XYZ. Did I mention the toolbelt itself talks? It not only makes the sounds of the tools but says “Nothing runs like a Deere” and “It’s time to work on our John Deere tractors!”. I love that when she looks at toys she doesn’t see things as a boy toy or a girl toy. They’re simply toys she likes or doesn’t like. And while it’s always fun to be a mermaid or fairy I really enjoy watching JustaBXgirl learn about real life items and occupations. A lot of times as parents we get our children toys and then just leave them to play with them (cough, cough, I’m very guilty of this) but when we do this we sometimes miss learning moments. Even though her toolbelt is something that I love for the independent play and imagination moments that grant this mama some time at the computer I also take some to go over what each tool is and how they can be use. This does two things. First it gives JustaBXgirl some valuable information that she can use throughout her life (I mean how would you have gotten this far if someone hadn’t introduced you to how to use a hammer or screwdriver). And second it gives her a point of reference for when she’s playing. Who knows, maybe one day my imaginative, mermaid fairy will grow up to be a contractor with her own construction business. Whether she does or she doesn’t she will know that when screwing in a screw it is always righty tighty and lefty loosey. Don’t pretend you don’t say it in your head regularly! And to think it all started with her toolbelt. And on the weekends when her cousins are around she is nice enough to share her tool belt with them. One of my nephews especially loves it. He’s really good at building things and figuring them out. He might become and engineer or architect when he grows up. Wonder how much credit this auntie will be able to take if I get him his own John Deere Toolbelt Set! He was excited to get to bang things! This is a great addition to our pretend play toys. I’m really considering buying my nephew one for Christmas. You can get your own by entering my giveaway!!! All you have to do to be entered is comment below and tell me would be the little builder in your world! For a bonus entry comment on this post. Winner will be selected using random.org and contacted by email on July 21st. Open to U.S. Residents excluding Hawaii and Alaska. my nephew is the builder. My Son who loves to build anything he can get his hands on! Blocks, Legos, anything!! This is too cute, my LO is a bit too young for this but she has 4 girl cousins who would love this. The little builder, and the perfect age for this set, would be my 4 year old nephew. He would love it! My son is my little builder and he would love this! It would allow him to be just like his dad! My son would be the builder in my house! Both my son and my daughter are little builders ! and they’re little country kids lol we love John Deere in this house ! Don’t they have such fun and durable toys!!!? My granddaughter is always trying to help grandpa fix things. She would love her own tools. I would love this for my nephew, thanks! This would be perfect for my nephew! My little grandson is the builder in our family. The builder would be my grandson. My little builder would be my grandson. He feels important when he cabn help. My little builder is my niece’s sweet little boy. My daughter would be the little builder. She likes to tinker with all sorts of stuff. this set is so cute! my son is a little builder who would love this. My 3 year old son is the little builder in my world. my daughter is the little builder in my world. Our 2 year old sons and six year old daughter would all love this. My youngest son is the builder. Always trying to “fix” things. My daughter is a little builder. She likes to help my husband. My son is a little builder and would love this. I commented on the beyond tablet post. My granddaughter and my grandson would both go nuts for this. They love play building and helping pop pop really build. I am definitly going to look further at this for Christmas. our little builder is our son, he loves to build things. My niece loves to build & create things! My niece would be the builder. My nephew is a little builder. He especially loves hammers. My nephew would be the builder in my home. This would be the ideal gift for my six year old son. My niece would be the builder! My son would love this. He loves playing with tools and pretending to fix things. My daughter is a great little builder! My grandson Cameron would be a little builder and I think he would love playing with this tool belt. my son would be the little builder who gets to enjoy this. I have two sons and they both are builders, but my littlest would be the one to use these! This tool belt would be for my 3 year old grandson, he loves to work with his dad outside. I posted the following post on the Beyond Tablet “What a great alternative to staring at a computer screen all day/night. My four grandchildren would gain great knowledge from this educational toy. My little builder is my nephew!! What a creative and fun toy. I would give this to my grandson~He would love it! My little builder is my three year old, Blaze. He loves pretend play!! i also commented on the other post. My four year old is a builder. My niece and nephew would be the little builders! They’d love this. Thanks! I commented on the additional post. I have TWO little boys 🙂 they’d have to share this one! My little cousin would love this. Our little 3yr is our builder, she would love this. My grandson Brandon is our little builder! My niece would love to win this, thanks for the chance. I have 2 young nephews who would be fighting over this. It is the cutest thing ever! My best friend’s son would be a good builder with these tools. My youngest son and daughter are our builders! They love to “help” daddy! I would share this with my toddler cousin. Stella Jane is our little builder. This would be an awesome tool belt for my grandniece. It never hurts for the little ones to learn early on what tools are for and how they are used. I wish we had these when I was little! My nephew would be the builder! My daughter’s are the builders. My little nephew would love to have these tools to play with. My daughter would be the little builder. She is always trying to take my husband’s tools and use them already! My nephew would be that little builder. I would like to thank you for your involvement in this fine giveaway. Thank you for giving us all the chance. I would give this to my little niece, she loves tinkering. My niece would be the little builder in our family!! My son is the little builder. My 3-year-old grandson would love this. He loves building things. My grandson is my little builder!